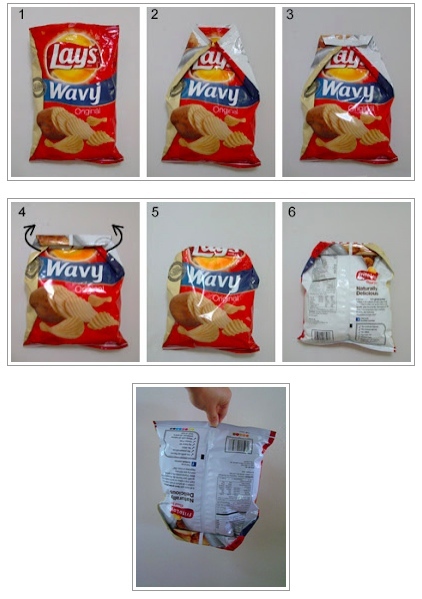 How to Fold a Chip Bag So It Stays Closed « Gluttoner: You gonna eat that? 1. Place the bag of potato chips on a table and flatten the top of the bag. 2. Fold the right and left side of the bag towards the middle allowing the corners to meet at the center. 3. Fold the top of the potato chip bag down. Keep folding down 3 or 4 iterations. 4. Insert your thumbs under the flaps made in step 2. Invert the flaps over the top edge. 5. This is how it looks when done. 6. This is how it looks at the back of the bag. Origami FTW. Gonna have to try this- I didn’t even know you could fold a chip bag and make it stay closed. Cue up the stars and the “the more you know” music.